What if I want a Wishbone Day T.Shirt? 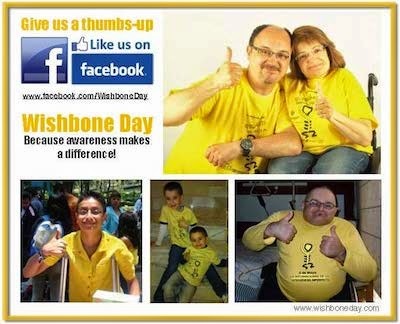 Wishbone Day is not a fundraising event so Wishbone Day supporters are encouraged to make their own unique Wishbone Day t.shirts. Making your own ensures your Wishbone Day message belongs to you. It is also a fun and creative way to get others involved ;-) You can download Wishbone Day Logos here. Can I sell my own Wishbone Day items? No. We ask that people do not produce Wishbone Day items to be sold for profit or fundraising purposes. (See FAQ item 1 and item 7 for more information on fundraising). What if I'm not into making my own stuff? can I buy Wishbone Day items already made? Yes. You can buy Wishbone Day t.shirts and other items from our online Wishbone Day store. There is no profit raised through the sale on these Wishbone Day items. 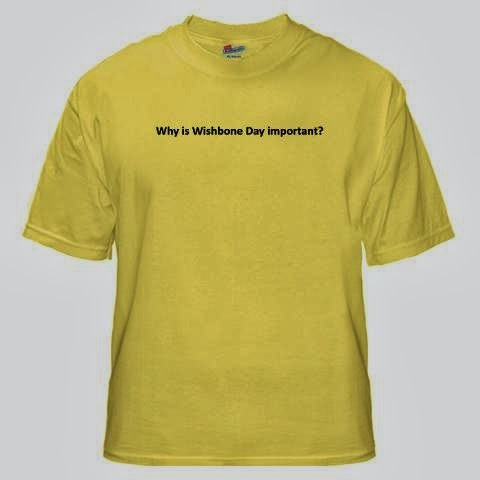 T.shirt front: Why is Wishbone Day Important. Back: Because Awareness Makes a Difference!